The beauty and experiences at The Golden Temple (Harimandir Sahib-Darbar Sahib), Amritsar. -The Golden Temple located in Amritsar, Punjab is regarded as the most sacred place of worship for the Sikhs. -The construction of The Golden Temple started in 1588 under the aegis of the Fourth Sikh Guru, Guru Ram Das Ji and was later completed by Guru Arjan Dev Ji. -The foundation of the Golden Temple was laid down by a Muslim Sufi Saint, Mian Mir. -The architecture is mostly made out of marble but it is gold plated with real gold, which covers most of the outside façade of the temple. -The water that surrounds the Golden Temple is known as Amrit Sarowar (Pool of Nectar) and the water of the pool is said to have special healing properties. -The largest langar or community kitchen is organised everyday where around 35,000 people per day are fed for free by the sewadars (volunteers). -All the diners have to sit on the floor, irrespective of caste, status, wealth or creed symbolising the central doctrine of equality, tolerance and selfless service to others (sewa without recognition). -The Golden Temple has four entrances indicating that people from all four corners of the earth are welcome here and permitted to enter and say their prayers or make a wish for or say a prayer for the goodwill of others (sarbhatt da bhalla). -The stairs entering the temple go down, rather than up like traditional holy places. They are deliberately designed in such a fashion to bring a sense of humbleness and eradicate arrogance in visitors. 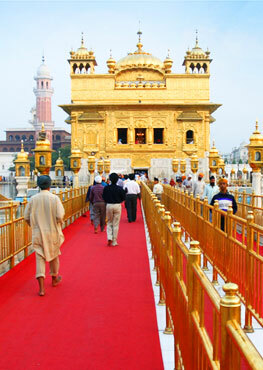 There are 84 steps to walks towards the entrance of the The Golden Temple signifying salvation of the soul. It is a must for not only for Sikhs but others to visit The Golden Temple and pay your homage. Not only the experience will be blissful but it also has a healing effect both on their mind and physical body. It is difficult to quantify the blessings and what one takes with them after their visit to the temple. "Once in Amritsar, just walk through the main entrance of the Golden Temple - the holiest temple for the Sikh religion - and try not to be blown away by the structure before you. And try not to be blown away by the beautiful mix of colours all around you as well, by the traditional music (kirtan) being played over the entire complex and by the happy and friendly Indians strolling along the marble walkway that surrounds the main temple (parikrama of pathway-four rectangular cubicles), locals who are typically from the countryside and who have rarely, if ever, seen a foreigner." Luckily, you can spend hours inside the Golden Temple without ever getting bored of the unique atmosphere. You can even eat a free meal at the langar hall (pilgrimage dining hall) and you can also spend a night or two at one of the temple's Gurdwaras (pilgrim guesthouses). The temple is open twenty-four hours per day. Yogi Madschri, a Danish living in London met me and described his personal experience of joy. "As part of a half-year long journey through ashrams, yoga schools and holy places in India I was able to stay five days in Harmandir Sahib in February 2015. Years earlier in London I had qualified as a teacher of Kundalini Yoga through which I had encountered the sounds and science of Sikhism. I value these teachings and the growth I have experienced through my own daily practice of Sikh Dharma. I was brought to visit and stay in The Golden Temple pilgrim accommodation through Divine grace. I spent hours by the pool in meditation and prayer every day, I offered my sewa and took langar. I queued and entered the Shrine late at night, in the early morning, in the daytime. I spent time in the Gurdwaras of the compound, I visited the Museum of Sikh History, and I engaged in conversation with visitors, students, pilgrims and holy men during my time there. In the early morning hours, under the New Moon, I performed my sacred dip in the pool. It does not take long to become immersed in the vibrating spirit of Consciousness at the temple compound. The sewadars emanate selfless service, thus making every interaction a meeting with God. Hundreds of men, women, and children go about the many chores of cleaning, cooking and caring with a delightful merry energy. Every meal served, every drop of water poured, every marble slab cleaned, it is all a manifestation of God's love. The Kirtan threads itself through it all, through every moment of every dimension, through day and through night. I acknowledged to myself while staying at The Golden Temple that I was having this divine experience yet I had not foreseen what happened at my departure. I was mentally and spiritually at ease with leaving in order to continue my travels, but my physical body did not like it! As I got up and walked away from the pool a wave of sadness washed over me, and I had to allow my body to shake, weep and sob a bit. Truly, it was the sweetest experience of sadness ever." Craig and his partner described their experiences as they "rose early and headed over to the temple to spend the morning exploring before eating lunch prepared by the Sikhs living and working there. The temple itself is part of the larger Harmandir Sahib (or Darbar Sahib) complex in Amritsar. 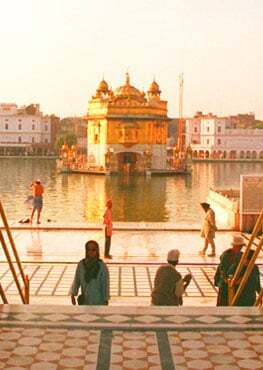 The temple shines in gold, sitting out in a tank that pilgrims from around the world come to bathe in called the Amrit Sarowar (Pool of Nectar). Most of the men bathe in the open, public areas, while there is a private, enclosed space for women to use for bathing. The water in the tank is considered to be sacred. Seemingly floating in the sacred water is the temple itself. Lonely Planet India notes that the temple is 'a blend of Hindu and Islamic architectural styles, with an elegant marble lower level adorned with flower and animal motifs in pietra dura (marble inlay work, as seen in the Taj Mahal).' The second level of the temple is 'topped by a dome gilded with 750 kg of gold.' All throughout the day and until about 22:30 hours at night, leaders and musicians chant from the Guru Granth Sahib, the Sikh holy book. There was never a moment during our visit that the chanting was not happening in the complex. While I have volunteered in soup kitchens before (and not that there is anything wrong with doing so), the experience at the Golden Temple was a very different feeding and eating experience. The service came with no expectation and no judgment. It wasn't middle class suburban Christians coming into the inner city to feed some homeless people a meal and then retreating back to the safety of their neighbourhoods. The feeling of the dining hall was so distinct from these experiences. My lunch at the Golden Temple felt like community - actual community. Despite cultural and language barriers. Despite concerns over whether the food was "safe" for western tourists to eat. Despite knowing at some point that the little girl sitting beside me might approach me on the street asking for money, for a moment, we were the same. Just two girls sitting down for lunch served by those dedicated to their faith in the shadow of their holiest shrine. The sense of community I felt at lunch in the Golden Temple is one that I think many churches strive for in their outreach ministries but never quite find. My lunch amongst the Sikhs was both a humbling moment and a moment of revelation. After eating lunch, Craig and I returned to the tank to walk around the complex again. As the sun rose in the sky, we found a place to sit among locals and pilgrims in the shade. As we sat down amongst them, we joined their dosing and resting in the shadow of such a pillar of their faith. One of my favourite moments of the day was resting against the side of the complex, slipping in and out of a light sleep, feeling the faith of those sitting around me. We had another great experience at the temple that evening. Just sitting alongside the tank and watching the people who went by, we met Vishali, a young girl who was at the temple with her parents. She practiced her English with us and translated a few questions that her parents had for us, as well. (Where we were from, how we liked India, what our plans were for our 6 weeks in the country, etc.) We also posed for pictures with a few locals and pilgrims who were visiting the site. Later, a man around our age and a few friends sat down with us. He was a Sikh and became very interested in talking to Craig after learning that Craig had been a pastor. With the Golden Temple in the background, Craig and his new friend discussed religions in India vs. the U.S., Sikhism vs. Christianity, and a number of other topics." As also someone else described their experience: "The food is free and available to all at every Sikh temple. An army of volunteers prepares everything and at the Golden Temple, where some 100,000 people visit daily, it's truly an impressive operation. The food is simple, dhal (lentils), raitha (yoghurt), rice pudding, and chapattis (roti/bread). I had all but two meals at the temple the weekend I was there. They were good, everything seemed hygienic, it was some of the best process management and operation work I've seen in India and it was generally a great environment. It's all-you-can-eat, but you are not allowed to leave with food on your plate. Kind of rude to take the free food and waste it, no? But yes, you can refuse or stay stop when being served. I helped wash dishes one day after dinner one night. I was impressed with the process - an initial wash to wash away all the solids, then two more washes in two separate tubs, then rinsing. In a place infamous for its bad hygiene, three washing ensure a proper job is done. I only washed dishes for 60-90 minutes, but it was while washing the dishes that I realized just how many thousands of people eat there daily. There was a constant stream of plates, bowls, and spoons. Constant. Incredible. I would say I stayed one day longer than necessary. There aren't many things to see in Amritsar. Still, it was nice to be in such a tranquil place, full of positive energy. I'll be the first to admit that it can be a little intimidating being somewhere you feel so out of place, but with the Sikhs you need not worry. You are always welcome. Literally." Experience described by other visitors in their own words: It tells you the inner story of an individual: "Best place to visit once in a life time". As the name suggests, one feel's to be near almighty. It's a beautiful place to visit. Everything is so touching right from the religious chanting to the arrangements you will something special to visit this place. It was my 06th visit to golden temple and every visit is far beautiful than other. One of the best places to visit in lifetime." "Go at amrit vela at 03:00 hours to really experience the devotion. Amazing place to meditate on the third floor of the Temple itself and at any of the small rooms were the Granth is being read behind the Akal Takhat or inside Akal Takhat on second floor. Real peaceful energy." "Harmandir Sahib is just amazing. The whole temple is made of gold. The temple is surrounded by water and is right in the middle of the water, which makes the Gurdwara look amazingly beautiful. Without a question, it is the most beautiful Gurdwara in the whole world!!! It's a must visit!!" "If you are in search of true peace, visit Harmandir sahib and seek the blessings of Sikh Gurus. It's a place where you get all the answers to your questions about the real meaning of your life." My personal experience is very similar to others but every time, I visit The Golden Temple, I am overcome with feelings of joy and happiness. The serenity of the shrine brings tranquillity to my mind. The crowd or the sangat as they are called brings unity to all the souls. Sadly, at times my mind also wanders to the tragic raid by the Indian Army in 1984, which brought the daily programme at The Golden Temple to a standstill, and innocent souls were killed at the site. The beauty of the The Golden Temple was ruined with grave consequences later. I try to wipe this out of mind and focus on my naam whilst sitting on the parikrama and watching the birds flying by and finding their own peace and solitude. Not forgetting my distress and tears of the lost souls, which still lingers in my mind. I speak about my experience to others and usually people are eager to listen and they tell me that a visit to The Golden Temple is on their agenda. It should be on everybody's agenda as mystically you only benefit from the visit in many ways. The Golden Temple has become part of my existence and whenever I am in India, something in my inner self drives me to visit The Golden Temple. I love to live there and be part of it. The soothing kirtan, peaceful souls and the spirit and intense love for Waheguru. I suppose absence makes the heart grow fonder as those living in close proximity do not even enter The Golden Temple; they pass by and take it for granted. It is more beneficial even though briefly to have darshan (blessings) as one do not know what benefit you gain from the visit, as we are unaware of all the mystic powers. It is definitely worth paying your obeisance to The Golden Temple, if you are in Amritsar !!!! !